At Least Two Dozen Dead As Car Bombs Explode In Baghdad : The Two-Way The explosions targeted mainly Shiite neighborhoods. The attack comes amid increasing Shiite-Sunni tension in Iraq. Iraqis inspect the scene of a car bomb attack in the Ameen neighborhood in eastern Baghdad on Sunday. At least two dozen people are dead and dozens injured Sunday in the Iraqi capital, Baghdad, after multiple car bombs exploded within minutes of each other in mainly Shiite areas. NPR's Kelly McEvers is reporting on the blasts for our Newscast unit. 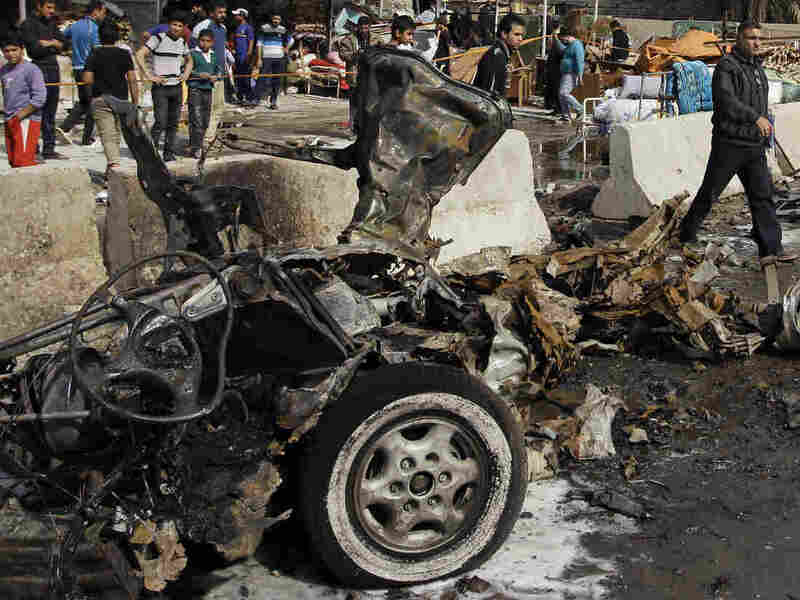 "The explosions targeted shops and outdoor markets in Shiite districts around the city. After the blast helicopters were circling over many parts of the city. "Overall violence has gone down in recent years but lately there've been a string of suicide attacks targeting Shiite interests and security forces. "A suicide bomber killed a top Iraqi army intelligence officer on Saturday. Tensions between Shiites and Sunnis are on the rise again in Iraq, as widespread protests in Sunni areas have called for the downfall of the Shiite-led government." The Associated Press reports that the attacks began when a car bomb exploded in Sadr City, a predominantly Shiite neighborhood. Two parked cars went off elsewhere in the area. "Simultaneous explosions hit the southeastern Baghdad neighborhood of al-Amin, where the force of the blasts left behind little except the mangled chassis of two cars that delivered their payloads. "An open-air market in Husseiniya, just northeast of the capital, and the Kamaliya area in Baghdad's eastern suburbs were also hit. "Another car bomb exploded near street vendors and a police car in the central commercial district of Karradah." The AP reports that just this month violent attacks have killed more than 100 people in Iraq.